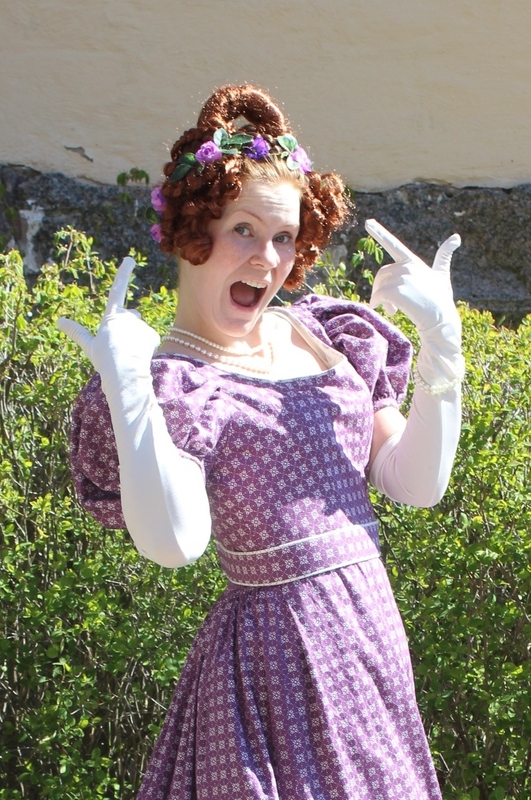 One of the things I got the most compliments on wearing the new 1825s outfit was the crazy as hair I sported. 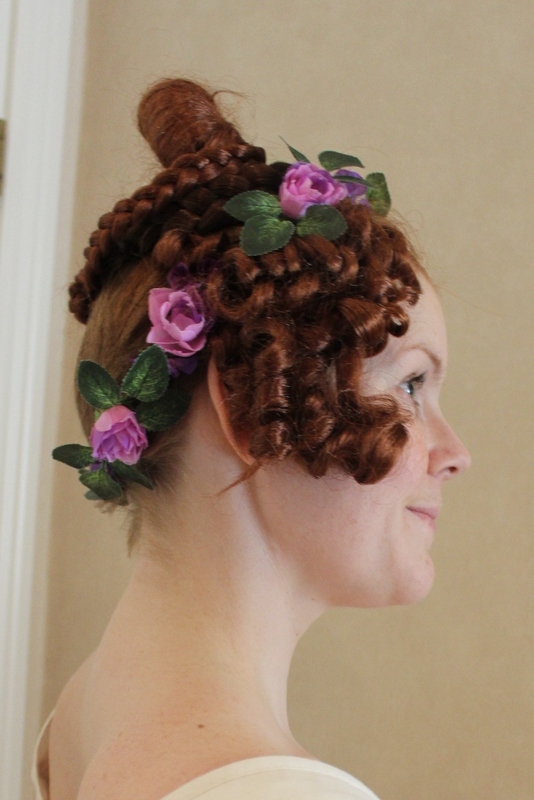 Since I don’t have a lot of hair on my own – modern everyday style beats once in a while historical hair-possibility’s, I needed to do something drastic to disguise the modern me for the upcoming historical ball. My first thought was to use my “go to” solution – A turban. 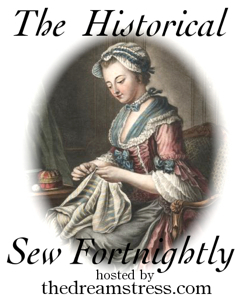 It’s easy, cute, comfortable and perfectly accurate for the time period. 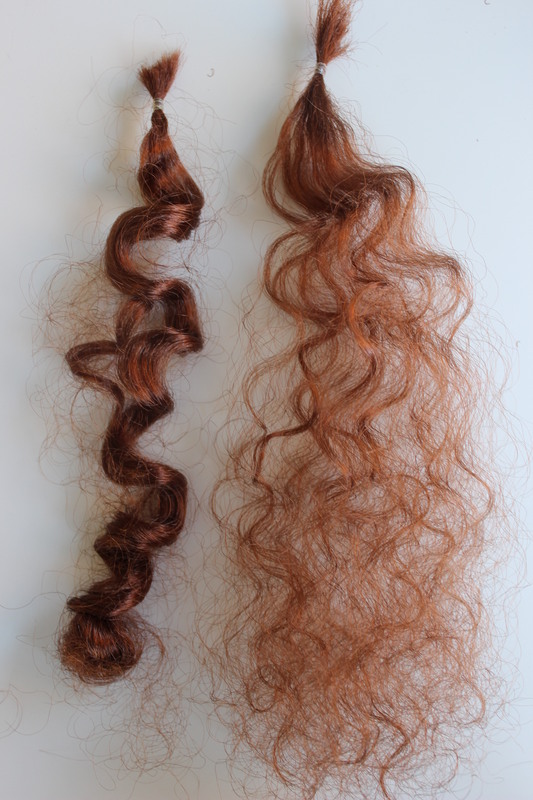 I searched my bookshelf, my bins of hair-accessorize and the box of neatly rolled spool of fake hair I’d cut from a wig a few years back and never used. 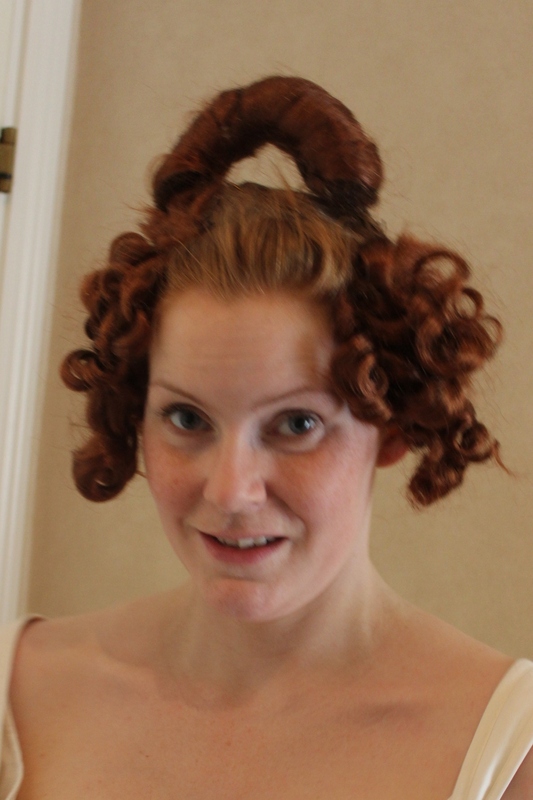 After reading through “The laced Angels” blogpost about her 1830s hairdo I felt confident enough to give it a try. 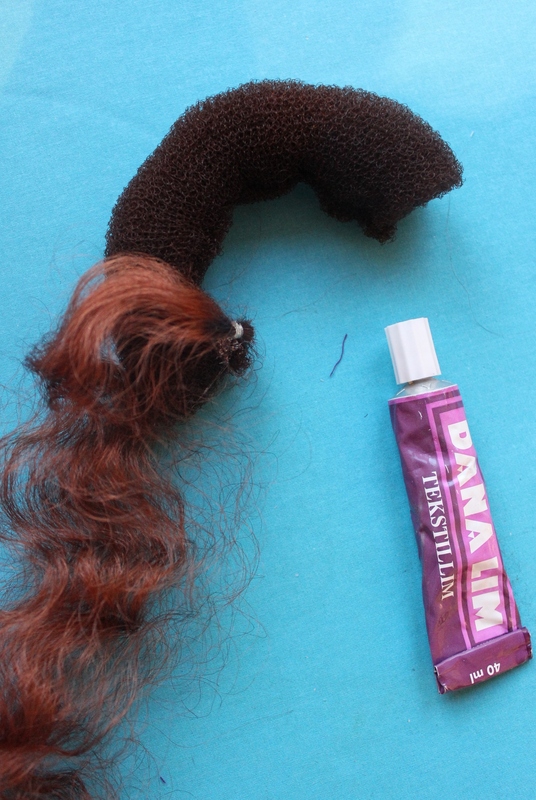 Then I separated a few of the curled pieces of fake hair and twisted them around the doughnut/crescent, adding glue where needed. 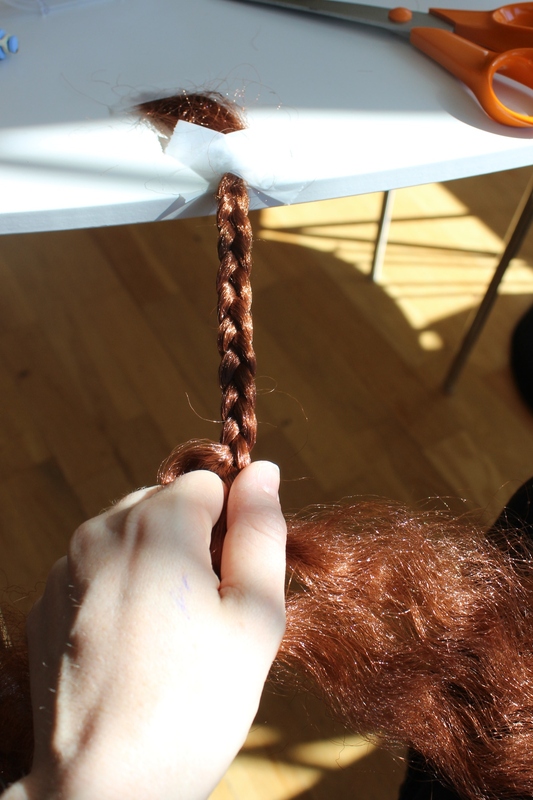 To make it sit more secure on my short hair I added two wig clasps to the ends of the piece. 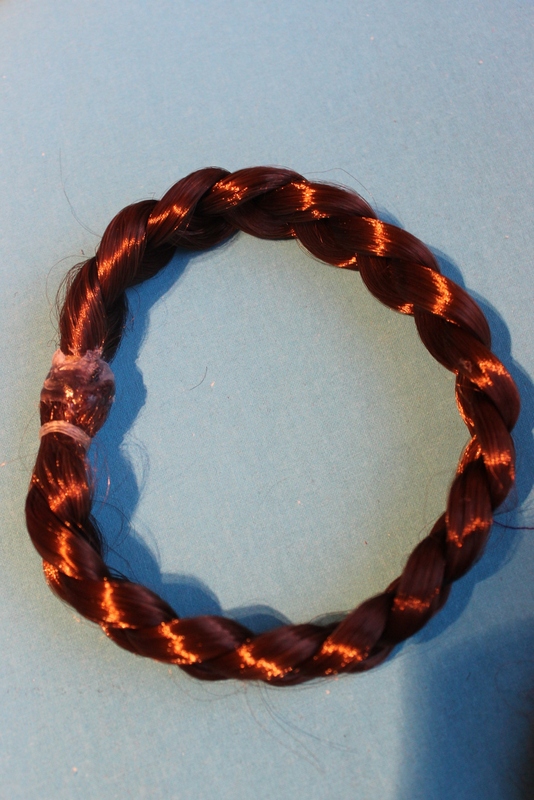 Then I cut the black elastic from a hairband-braid, and glued it together to form a circle. 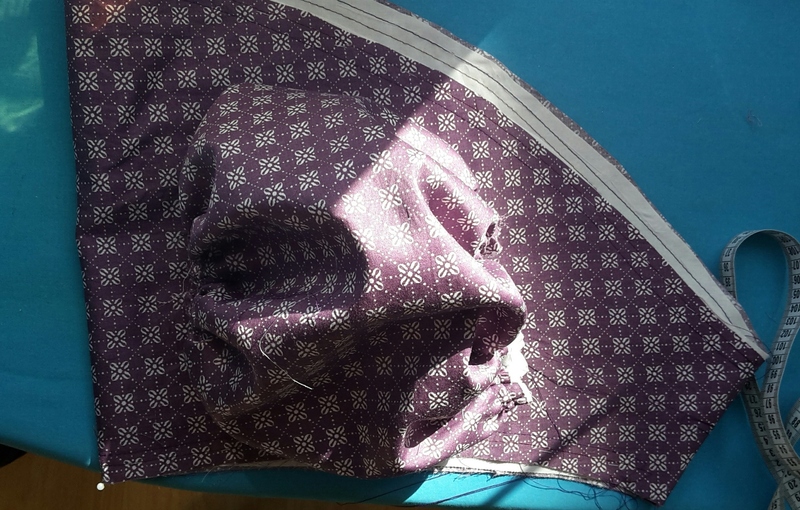 Not a nice joint, but it will be covered by other things later so I’m not overly concerned about it. 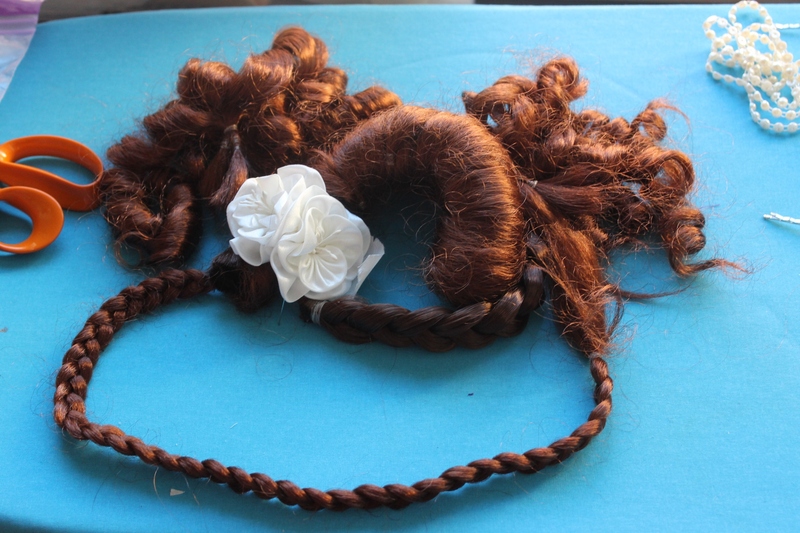 I Braided a few of the other pieces of fake hair, and put together a the rest into two clusters of curls for the bangs. 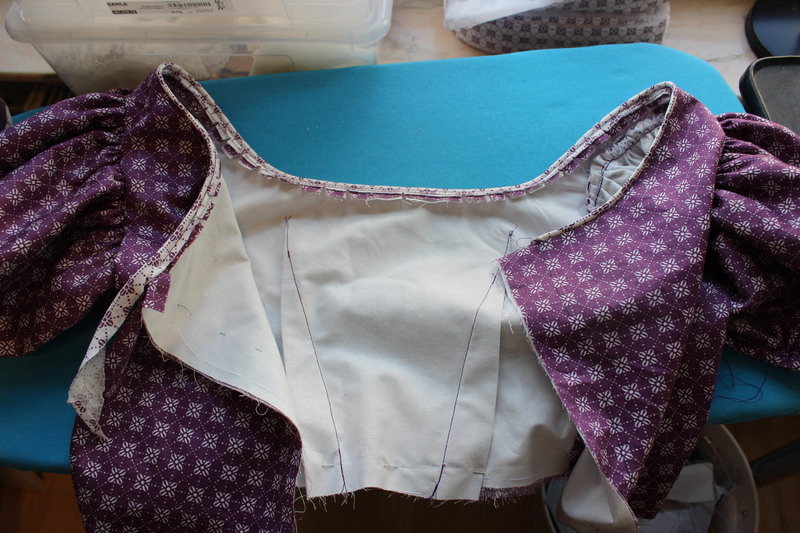 All the pieces lain out roughly the way the’r suppose to sit on the head. 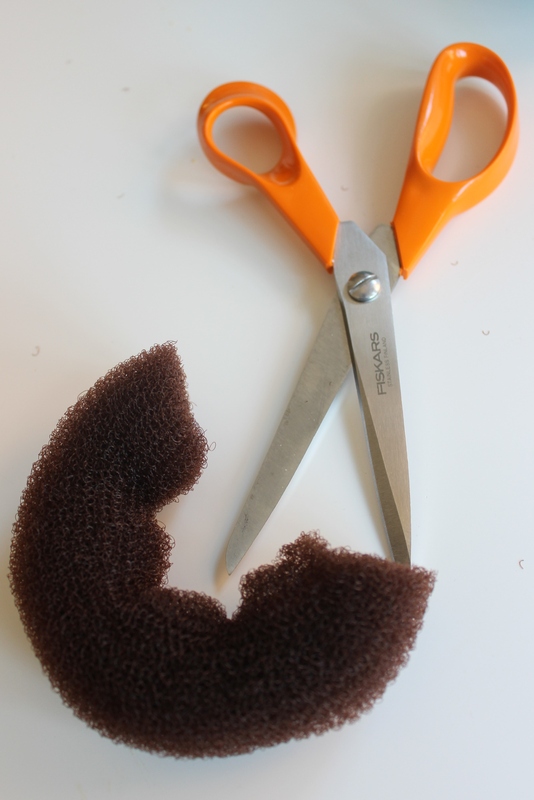 Starting with a back combing of my own bangs, and a brown hairnet, to keep all the short hairs from acting up. 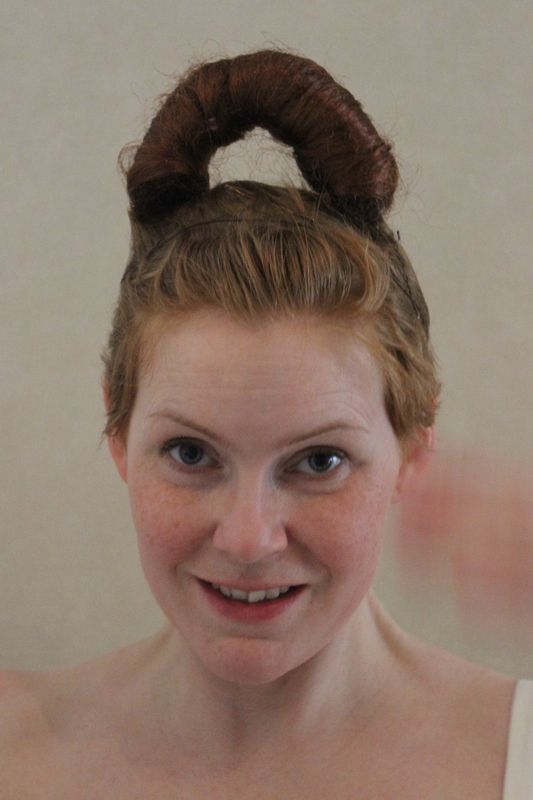 Then I pinned/clipped the crescent on top of my head. 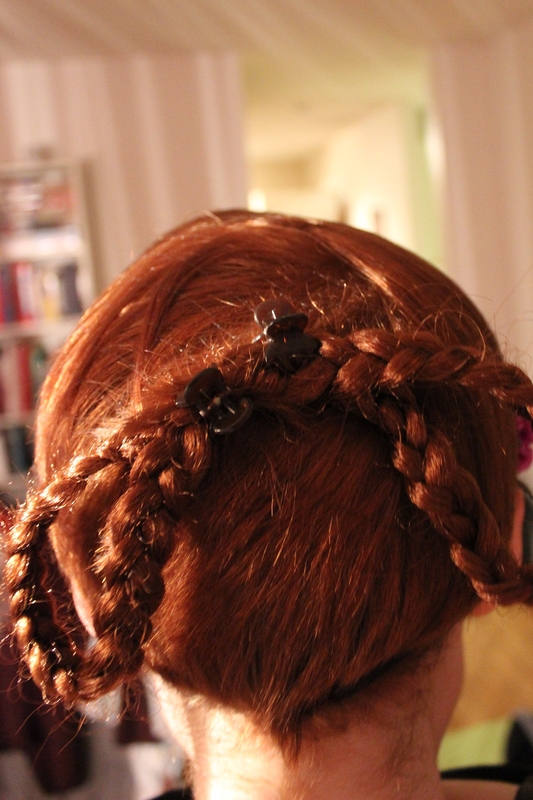 and put the two braids on to cover the edge of the cresent. 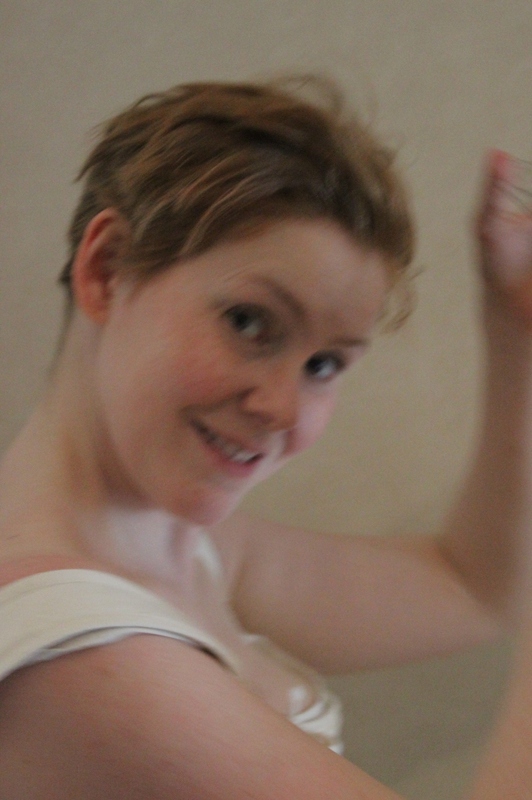 As you can see, I definitely needed to do something about the back of my head. 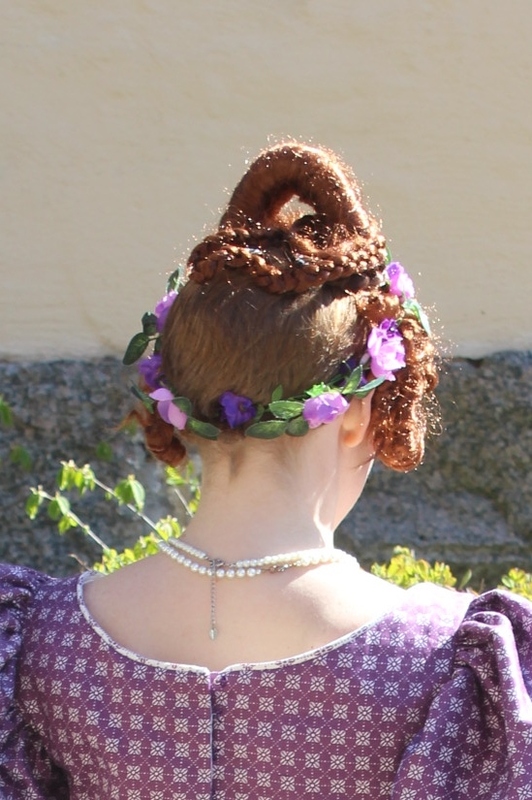 Something I fixed by re-arranging the hanging braid and adding a white flower over loops of pearls stitched to the back of my the thick braid. 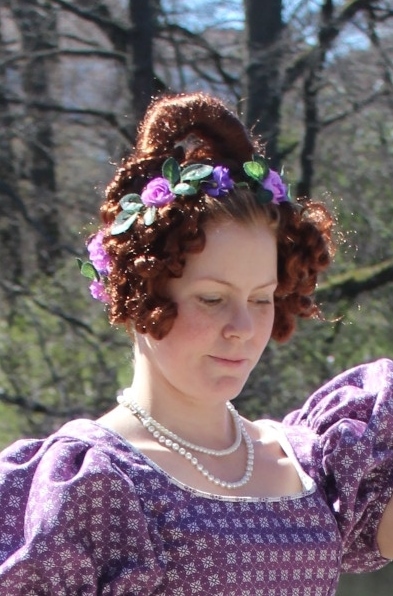 A few days before the event I dyed my hair a bit darker red to match the hairpieces. Blending together much better now. 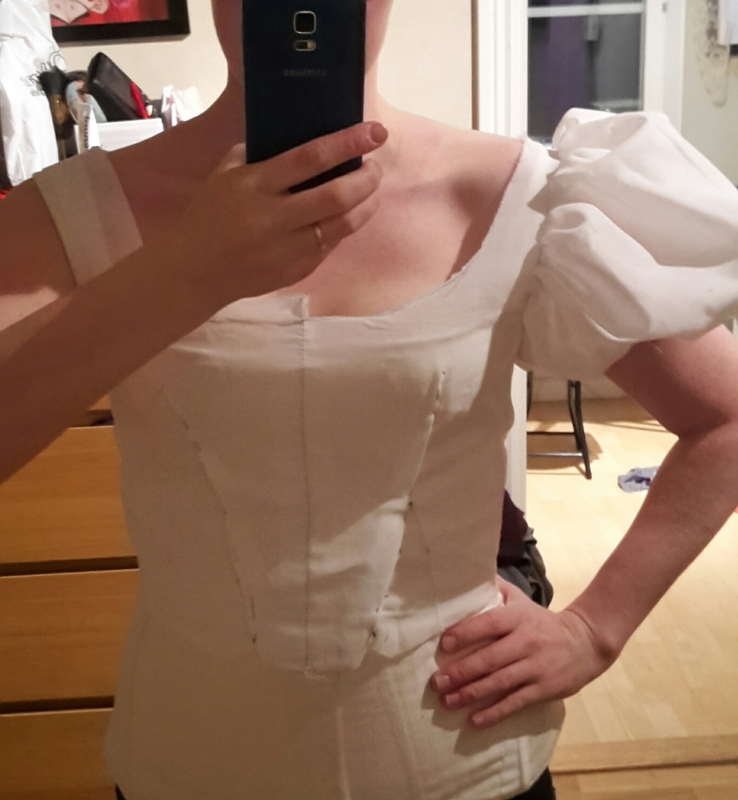 When talking about attending the spring ball this year (and deciding to make a whole new outfit (inside out) for my sister) I promised myself I would not make anything for myself (yeah right…). 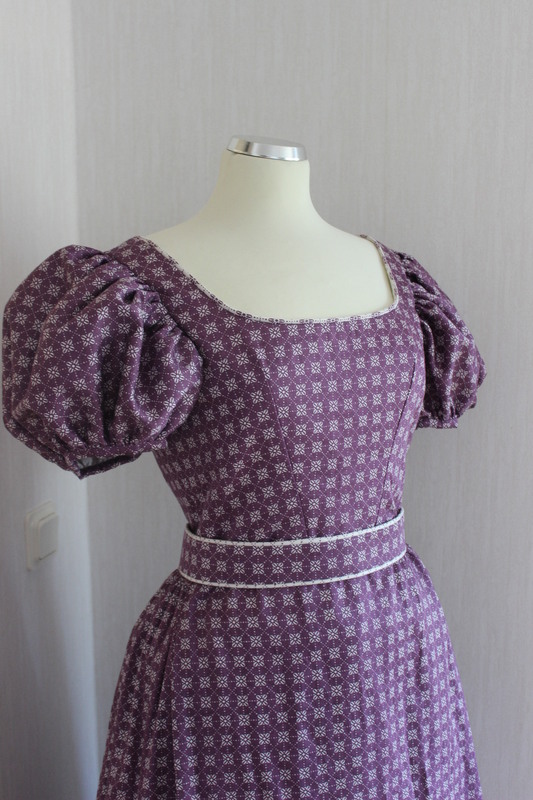 Since I already have so many dresses that almost never get worn, I convinced myself that I would use one of them, exactly which one would be a problem for later. 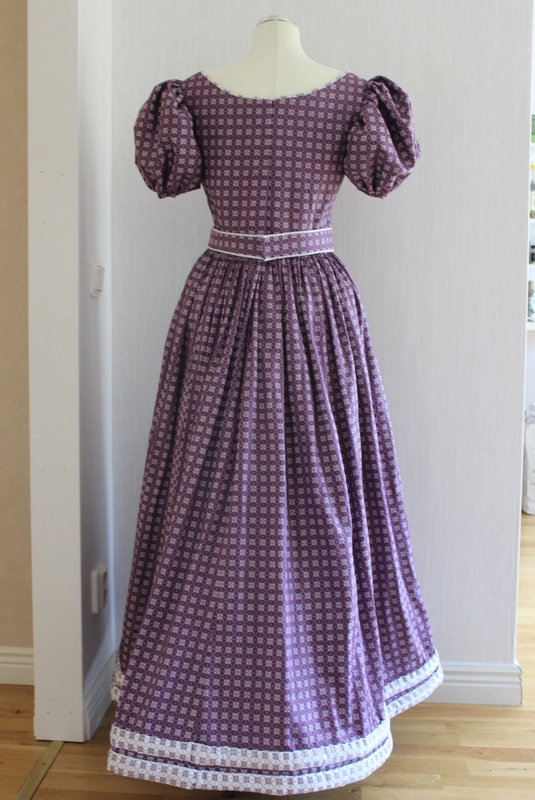 Some of the dresses I had to choose from in my closet. 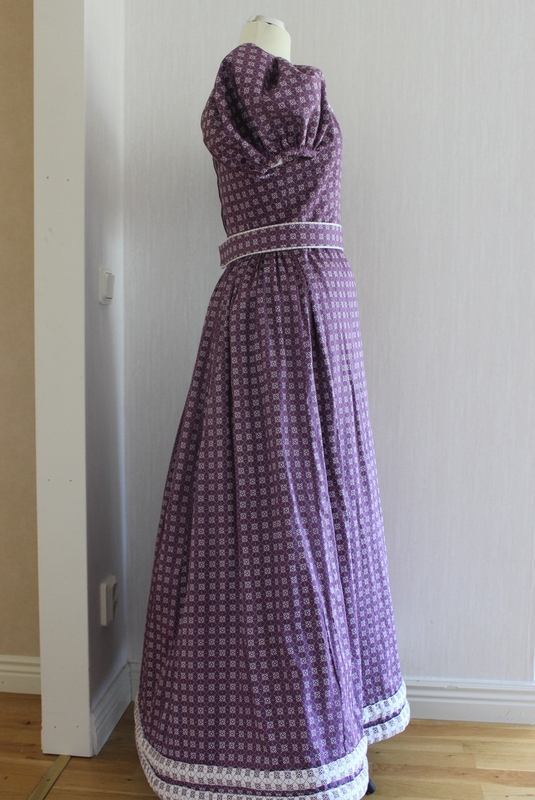 But as my sisters dress neared completion, and there still was 3 weeks to the ball, my determination started to falter. I made a quick sum-up in my head and (on paper) to see what, if anything, would be manageable, if, I decided to make some small thing anyway. 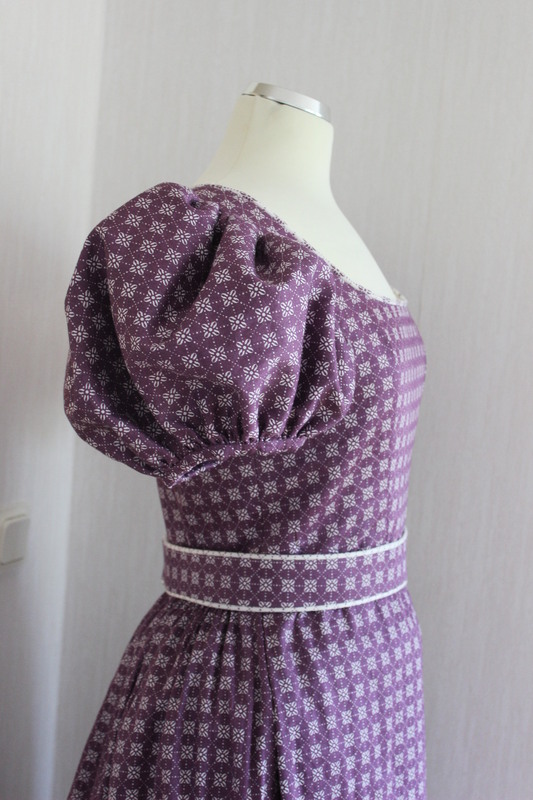 Could/should/would I make something like one of these? 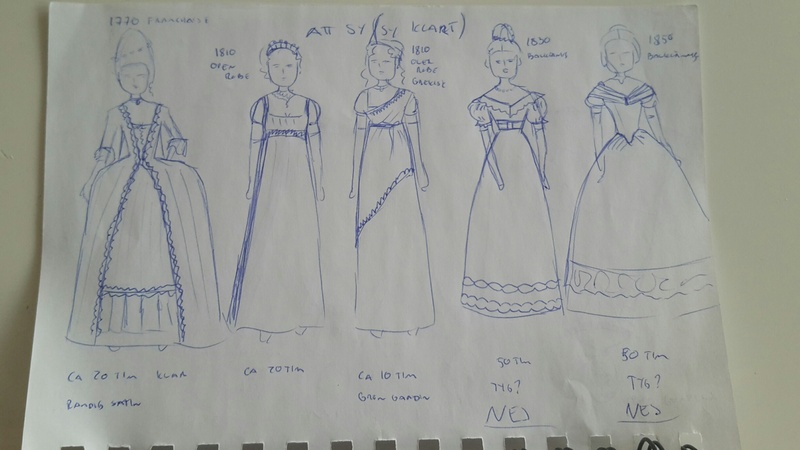 The following days I did a quick survey among my friends to find out what they intended to wear for the occasion. 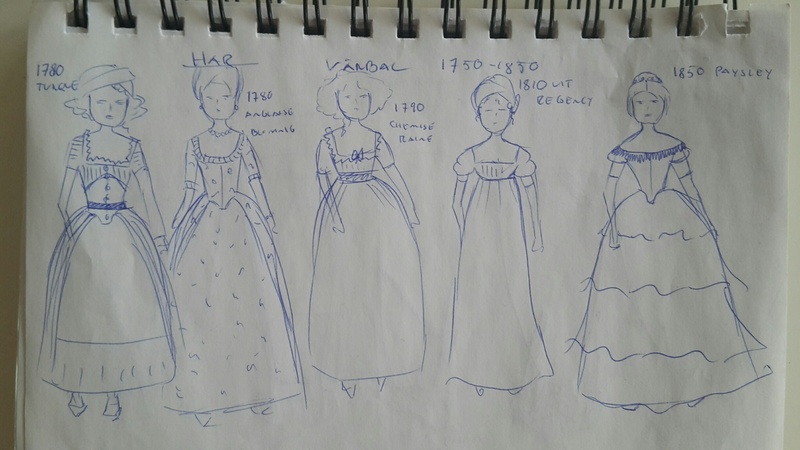 It turned out they all was to wear their regency style, mostly due to lack of space for big skirts on the dance floor (ops, maybe I should have known that before starting on my sisters 1860s dress…). 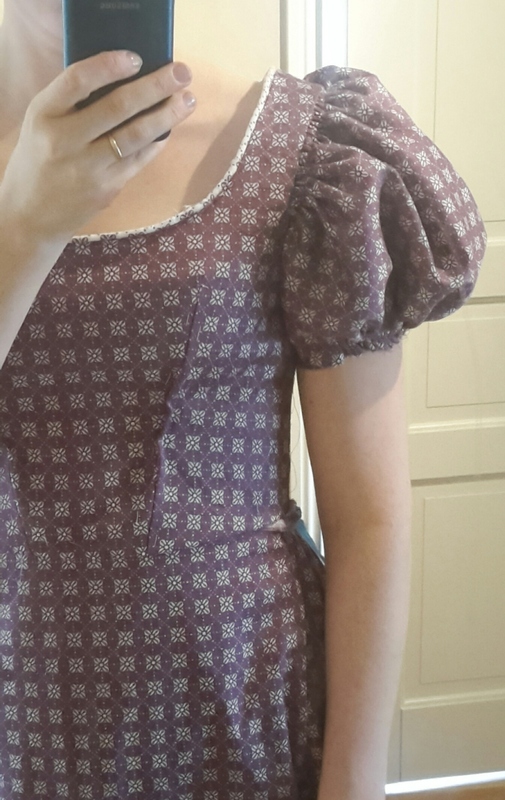 Sadly I didn’t felt at all like wearing regency. 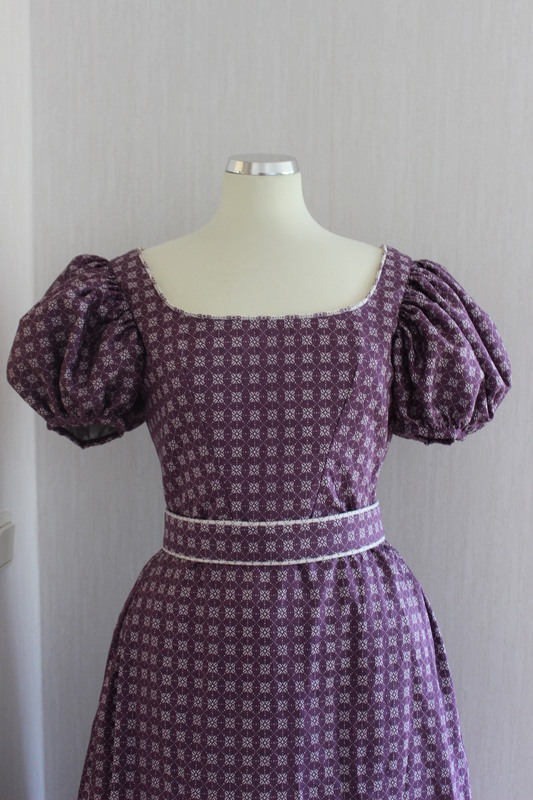 And all my old dresses seemed so dull and un-flattering, or overused. You all know this anguish. 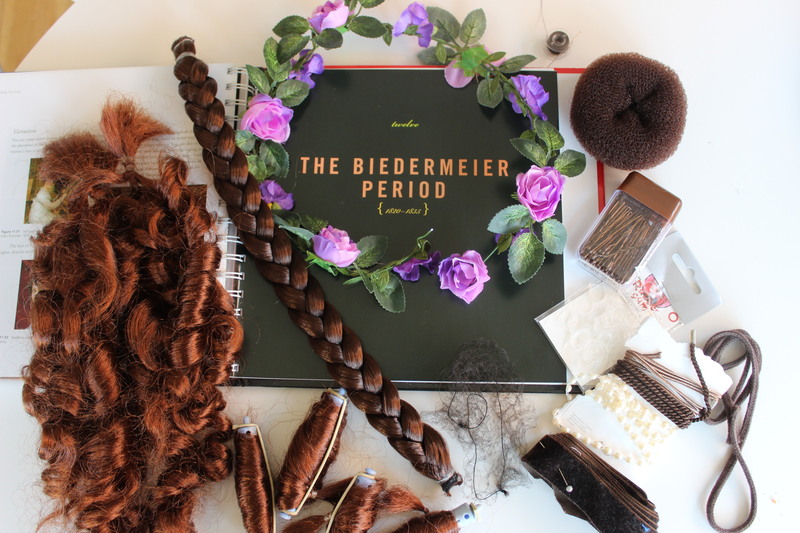 Without any particular plan in mind, I started rumoring around in my stash, hunting for inspiration. 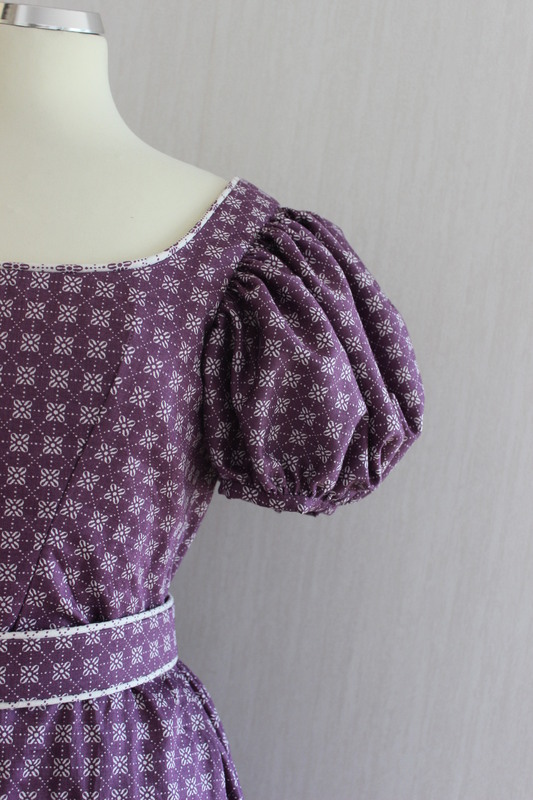 The purple fabric would however, be enough for a small/medium sized dress if carefully cut and using the pillowcase for the bodice. 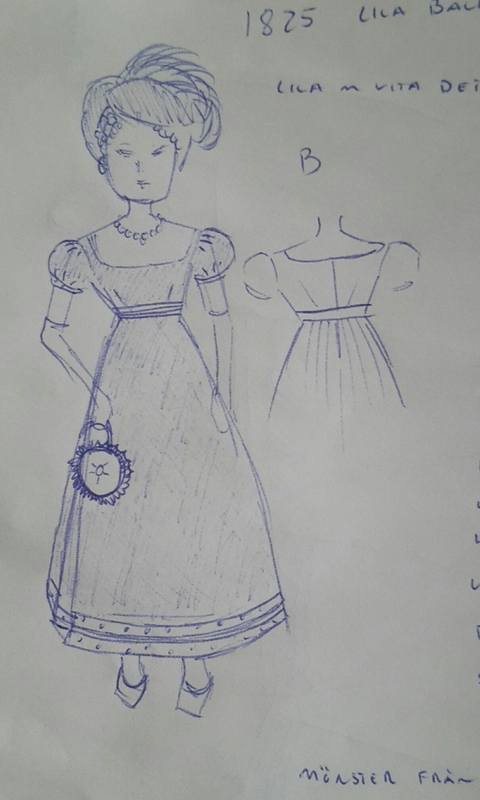 I would make a late regency/early Biedermeier dress. Time to get to work while inspiration was high. 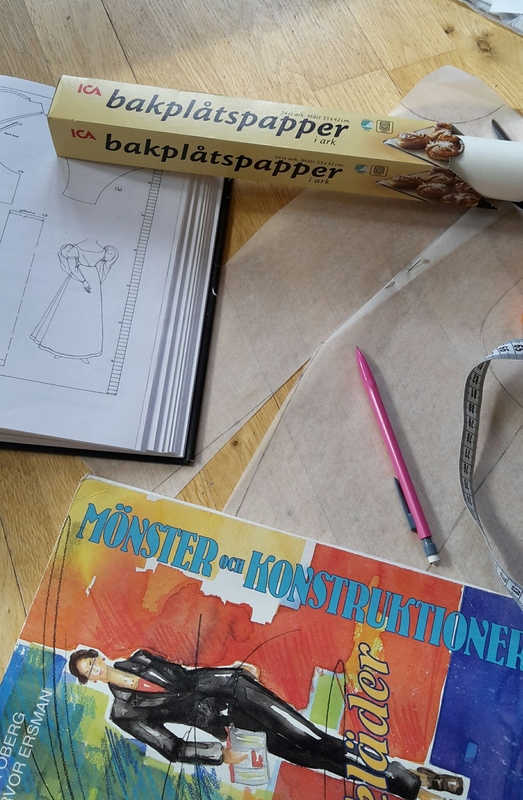 So I drafted a pattern using my regular templates, and since I’d recently run out of drafting paper and of course forgotten to get more, using baking paper for the bodice. Oh, come on, you’d all done it…? 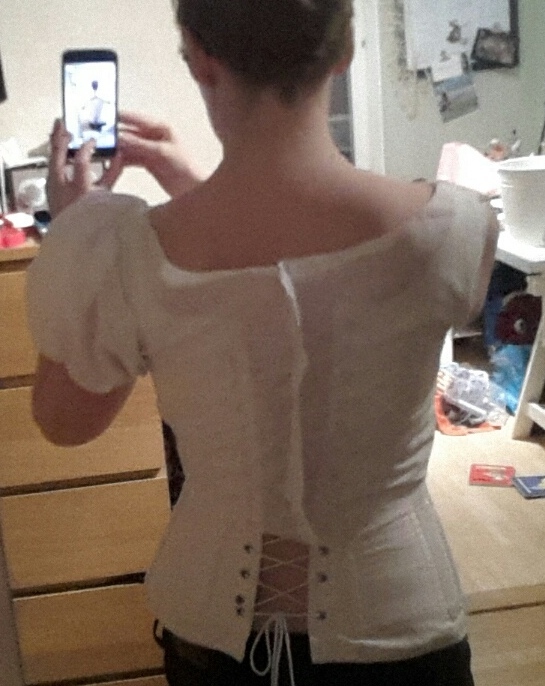 I made a quick mock-up and after some help pinning myself into it, did a fitting. 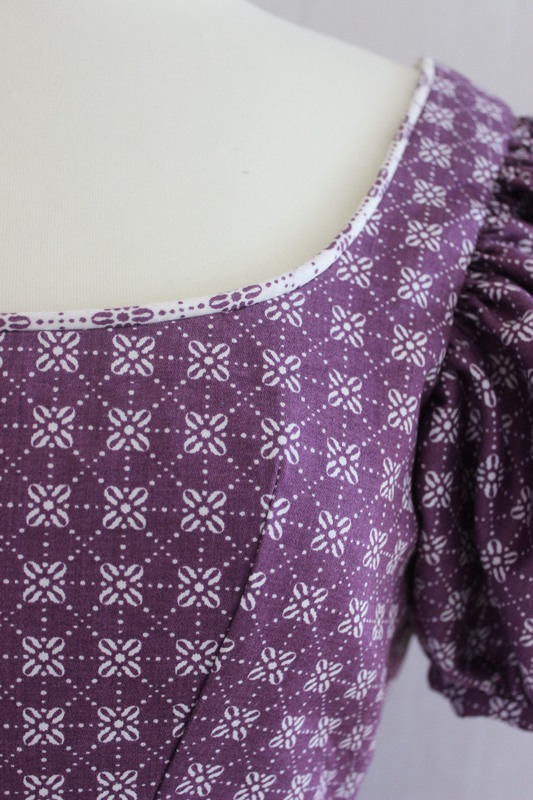 Adding darts in the front, lowering the neckline a tad, and taking the whole thing in at center back a few cm, was all that was needed. 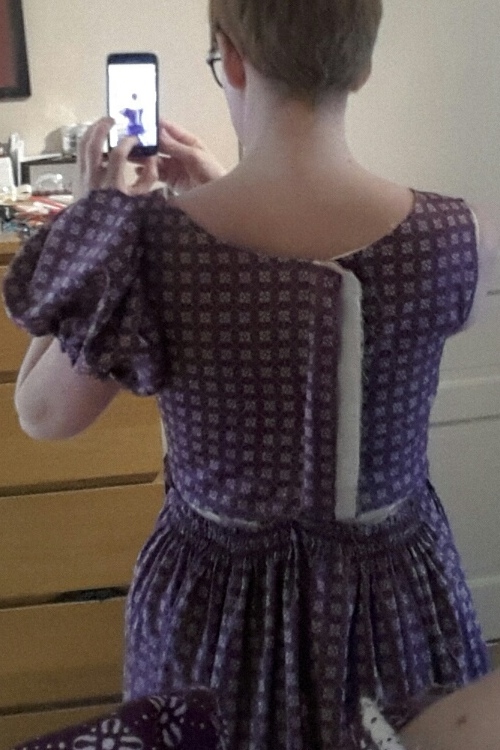 I interlined the bodice (and the sleeves), pinned and stitched the pieces together and added the darts at the front. 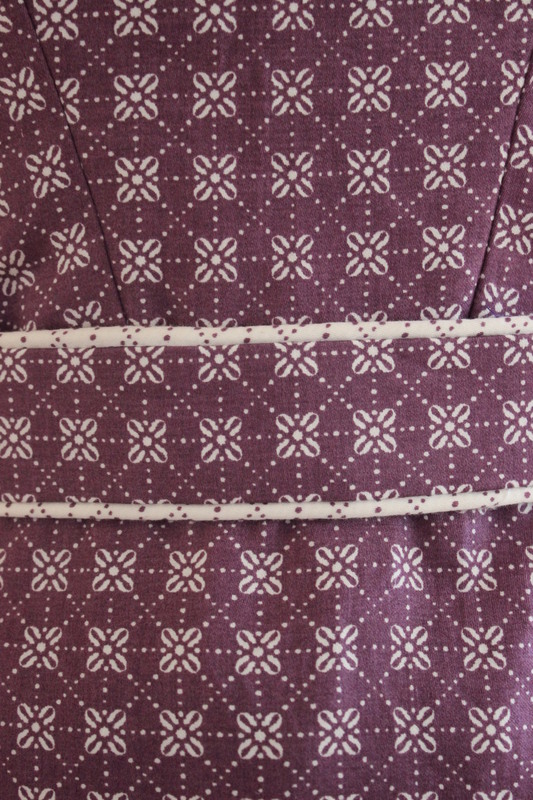 Then I stitched rows of gathering stitches on the sleeves and carefully gathered them to the right size. 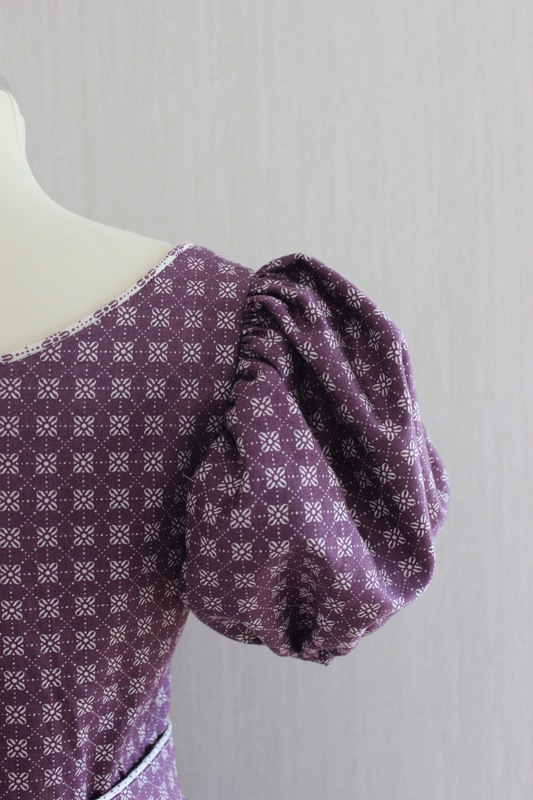 Huge sleeves – here is one done and the other one awaiting gathering. 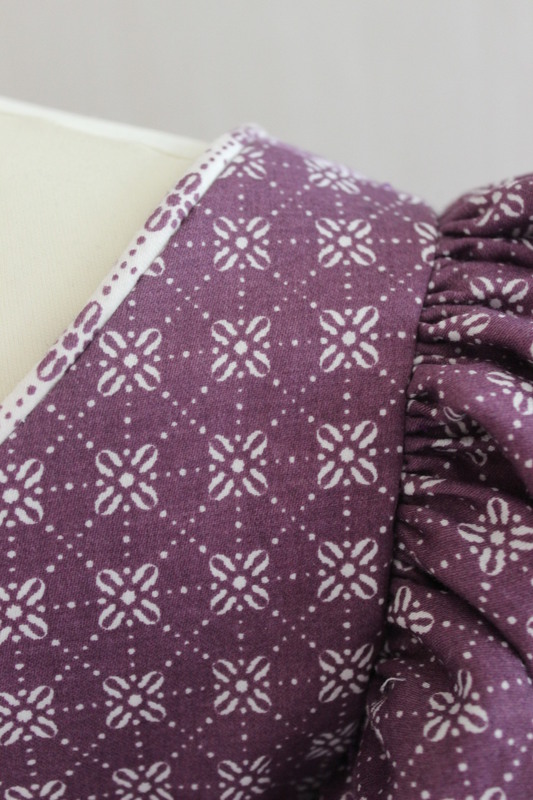 I pinned one sleeve and a piece of contrast piping to the neckline for the fitting, to get a better idea of how it would look. 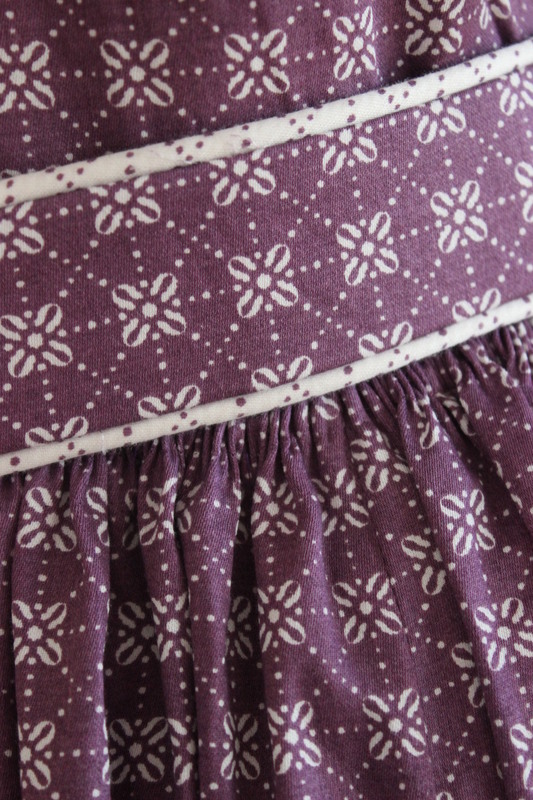 Once I was convinced the dress would fit right, I got started on the piping. 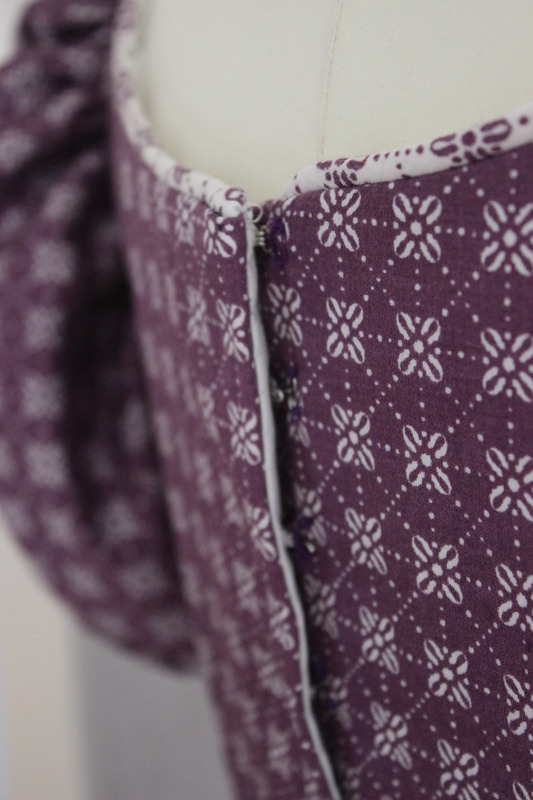 Using bias cut strips of the white/purple fabric combined with pieces of a cotton cord from my stash I soon had the 3 m or so I needed for the neckline (and belt). 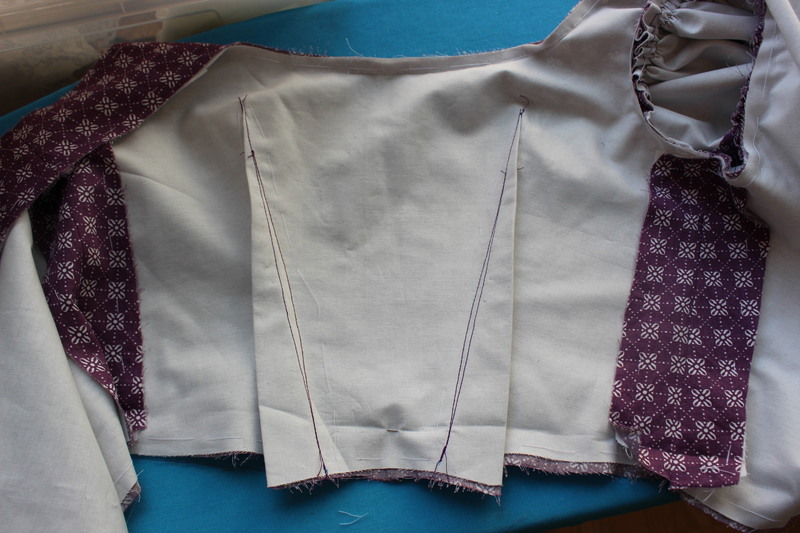 I stitched the piping to the bodice, and the pre-made skirt to the bodice, added lining, folded under the edges for closure and hemmed the skirt. 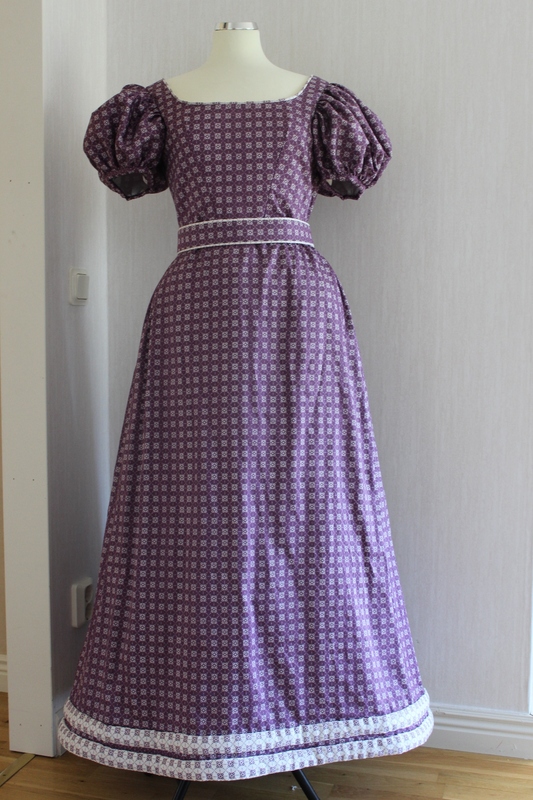 With a fully functional dress, is was now time to get starting on the decoration. 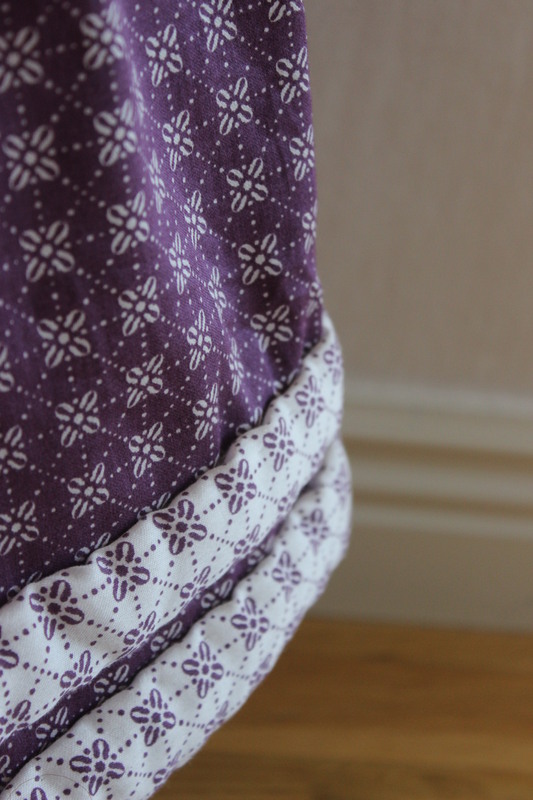 Since both Waugh’s pattern and several other sources I accounted called for a padded hem, I decided to give it a try. 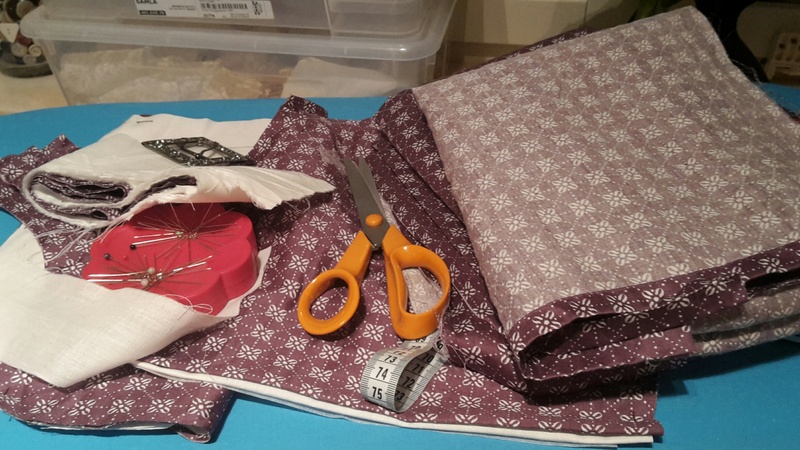 Cutting strips of corresponding fabric and basting it to cotton bathing, after which I tured the edges under and whip-stitched the ribbons to the bottom of the skirt. Basted strips waiting to be attached. 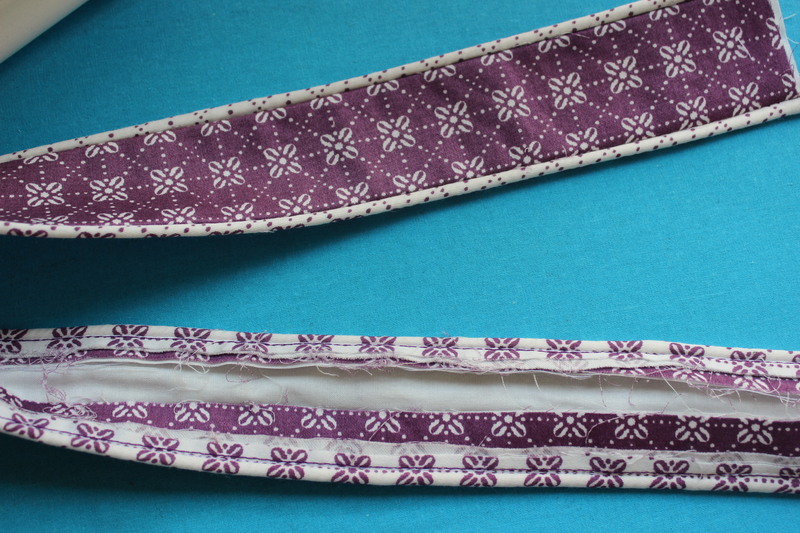 And lastly I used upp the final scraps of fabric to make a belt, backed with heavy interfacing and edged with contrasting piping. Working on the belt. 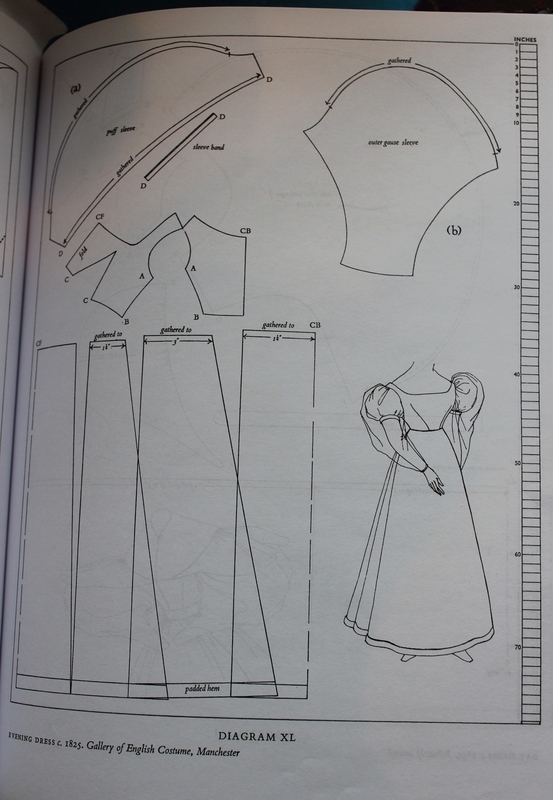 Pattern: I drafted my own, using Waugh’s “Cut of women’s clothes” as a guide. 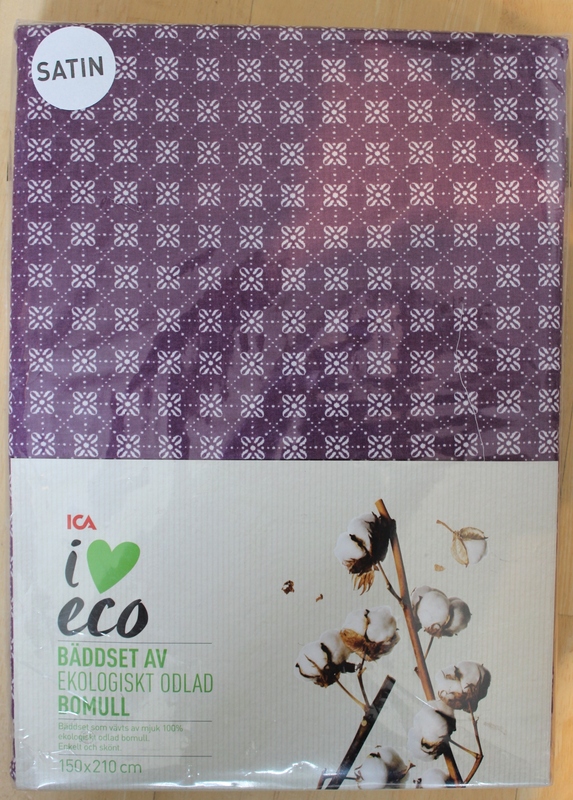 Fabric & notions: 1/2 of a purple cotton beed-sheets and 1 pillowcase (approx. 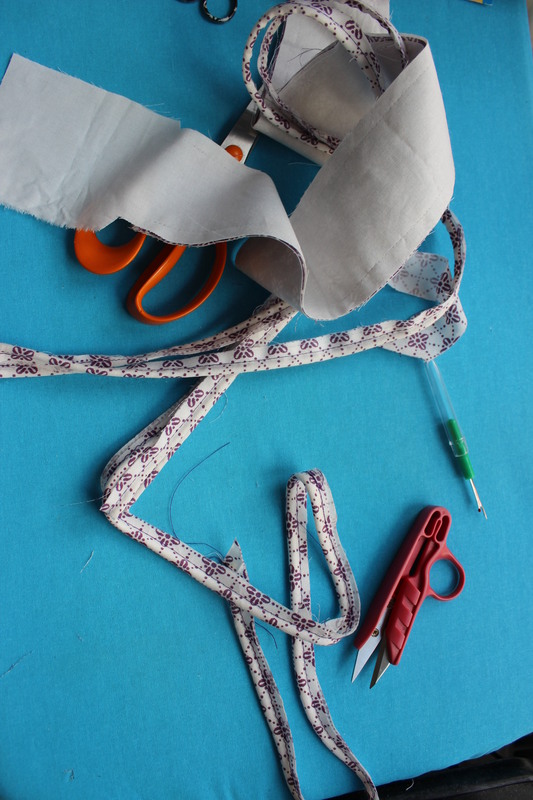 total 2,5 m fabric), 0,5 m cotton for lining and interlining, 14 pair of hooks and eyes for closure, 1 m stiff interfacing for the belt, 0,3 m of white/patterned cotton and cotton wadding for decoration, 4 m cotton string for piping. 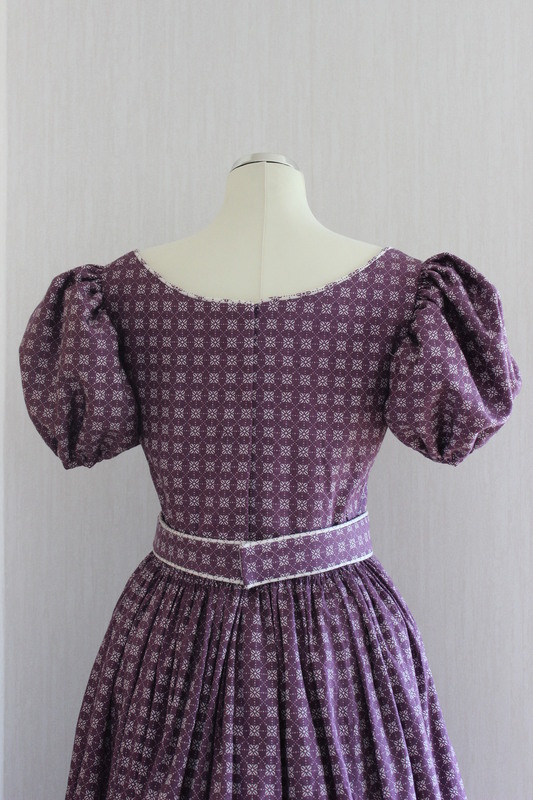 How historical accurate: So so, the material and silhuett are good, but the print and construction are all modern. Time: It was pretty quick so maybe 10-15 hours, over a timespan of 2 weeks. 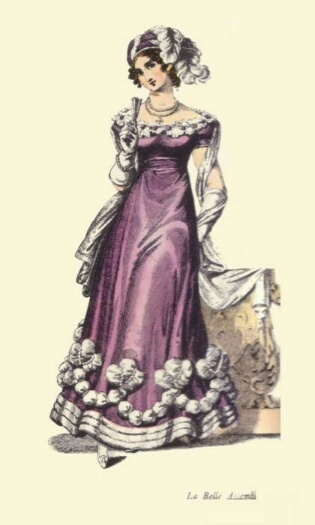 Final thoughts: This is one of my favorite dresses of all time. It is so fun and beautiful in a crazy way. 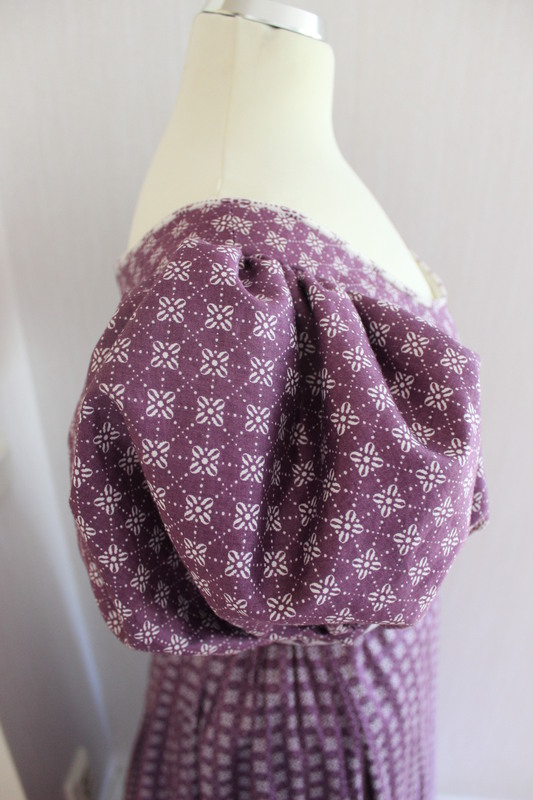 The color is really pretty and it’s so comfortable and easy to wear. I felt so pretty dancing around in it and got lots of compliments on it. I will most definitely re-visit this decade sometime soon.